Field Marshal Sarath Fonseka continued his verbal attack against former President Mahinda Rajapaksa and ex-defence secretary Gotabaya Rajapaksa, slamming them for taking undue credit over winning the war against the LTTE. 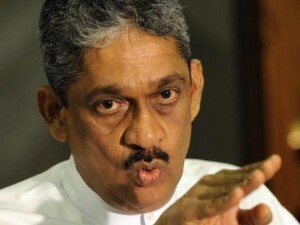 Addressing a news conference in Colombo this morning, Fonseka said that only the soldiers who were shot at and who were in the war front must take credit for the win. “Not politicians,” he said. Fonseka also claimed that when he had requested for several helicopters during the height of the war, Mahinda Rajapaksa had refused saying he didn’t have the money to finance such a purchase. But, three months after the war was over, he bought helicopters, which cost around US $ 150 million. The same people who couldn’t buy us helicopters to fight the war, bought them after the war, and are now shamelessly taking credit for the win,” Fonseka charged. While alleging that the Rajapaksa’s were involved in large scale corruption, Fonseka also hit out at the former defence secretary alleging that when Gotabaya was in charge of procuring certain ammunition, the cost of a certain purchase which was at 250 million originally, went up to a surprising 650 million. “There were days we didn’t have sufficient ammunition to fight, and we had to make do with just one rocket, but they are boasting so much about the so called leadership they gave, when they couldn’t even give us the basics to fight the war,” Fonseka charged. According to Fonseka, who was the Army Commander at the time the war was won, the ‘Api Wenuwen Api’ programme by Gotabaya, collected Rs. 4.5 billion. “No audit was ever conducted to verify how the money was spent. They made a huge fuss saying they were building houses for soldiers. But they built only 300 houses as of 8th January 2015, and even at the cost of 1 million per this two bed room a house, where is the balance Rs. 4.2 billion?,” he asked. According to Fonseka, even when Mahinda Rajapaksa, as the Commander in Chief of the Armed Forces kissed the ground at the Bandaranaike International Airport, soon after his return from an overseas trip on May 16, 2009, on reports that the war was over, the war was still been fought.